Pepi Fabbiano is a senior astrophysicist at the Smtihsonian Astrophysical Observatory. In addition to her duties with Chandra and her research into galaxies, black holes, and other aspects of the high-energy Universe, she also actively involved in helping bringing astronomy and its tools into the 21st century. I am just back from the spring meeting of the International Virtual Observatory Alliance (IVOA). The IVOA is an international collaboration of astronomers and computer scientists aimed at connecting via the internet archives of astronomical data world-wide. 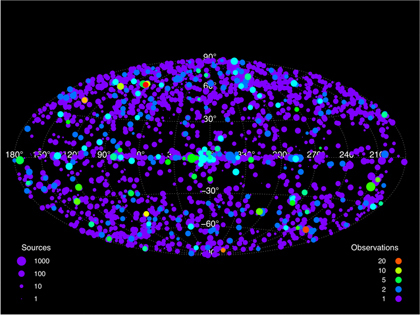 These are observations of the sky both from the ground and space and include X-ray data Chandra together with radio, optical, infrared and ultraviolet observations. The purpose of the IVOA is to develop standards so that anyone can retrieve data from the participant archives, publish their own observations to the world, and make the data "play together" to discover new aspects of the universe. The IVOA now has a recommended standard that can make computer-based analysis tools play together in a seamless way: the Simple Application Messaging Protocol (SAMP). If tools are SAMP-enabled, they can recognize the output of another tool, perform analysis on this information, and send the results back to either or to another tool. Some of the demonstrations at the IVOA meeting were impressive. In one of these demos, the positions of selected X-ray sources in the Chandra Source Catalog were displayed on an image of that part of the sky (this can be either a Chandra image or an optical image from a telescope on the ground or the Hubble Space Telescope or any other astronomical image). Other information about these sources -- brightness, color, etc. -- was then plotted as a graph in another tool; some strange points were highlighted and this information was reflected in the image display. This type of analysis is usually quite complex and requires intermediate steps, such as saving and reading intermediate data products. Now it all can be done in a single session with clicking, pointing and filling up some simple information on the screen. In another demo, two astronomers on their computers, with only the internet in-between, were able to see each other actions and results and change them back in real time, as if their were working in the same office. With this new approach astronomers in different parts of the world soon will be able to use each other data and do research together at the same time.